Next post: More chocolates for the SJ Quilt Museum fundraiser! After working with my friend Lieven on setting up my area for photography, I realized I needed better lighting than I had. 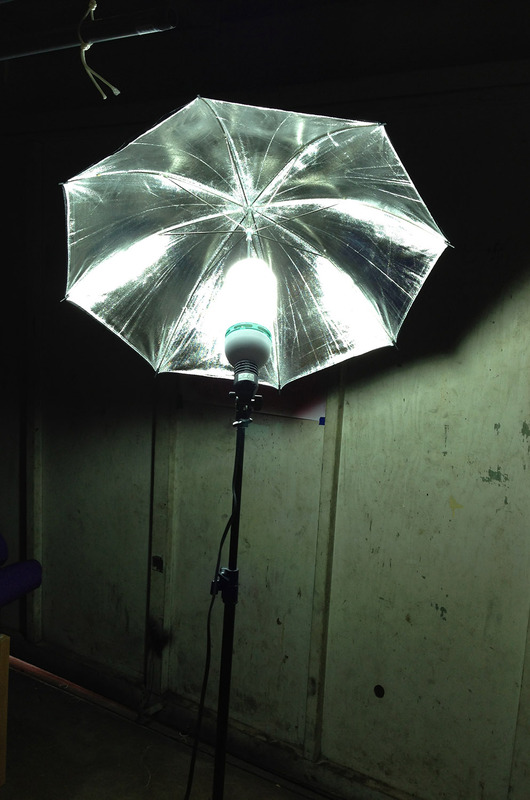 So I went to Amazon looking for a light setup, and to my surprise, found a basic lighting kit for just over $50! 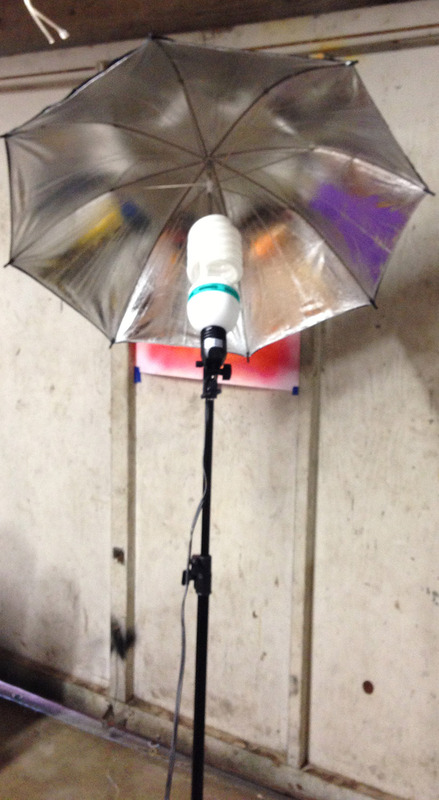 It arrived today, and now I have two light stands, two reflective umbrellas, and two enormous daylight compact fluorescent light bulbs. The color looks green in the photo, but that’s my iPhone camera’s problem – the light is a nice soft white. So now I can solve one of my pesky problems – how to get good, even lighting on my work. Meanwhile, by dint of several hours pounding out prose, I’m starting to make progress on my other goals. I have outlined my museum lecture and my Designing Fabrics Study Group article – not satisfied with either yet, but a fair start – and am caught up on the book blog through Tuesday. I haven’t written the book proposal yet, but I’ve decided to work on that while I’m traveling. I’ll be flying ten hours and taking the train for ten hours during the trip – that’s twenty hours, enough to make some real progress, and since this project doesn’t have a deadline I’m putting it off until the more urgent items are done. So I have time for more urgent stuff…like…weaving! Not very interesting, is it? 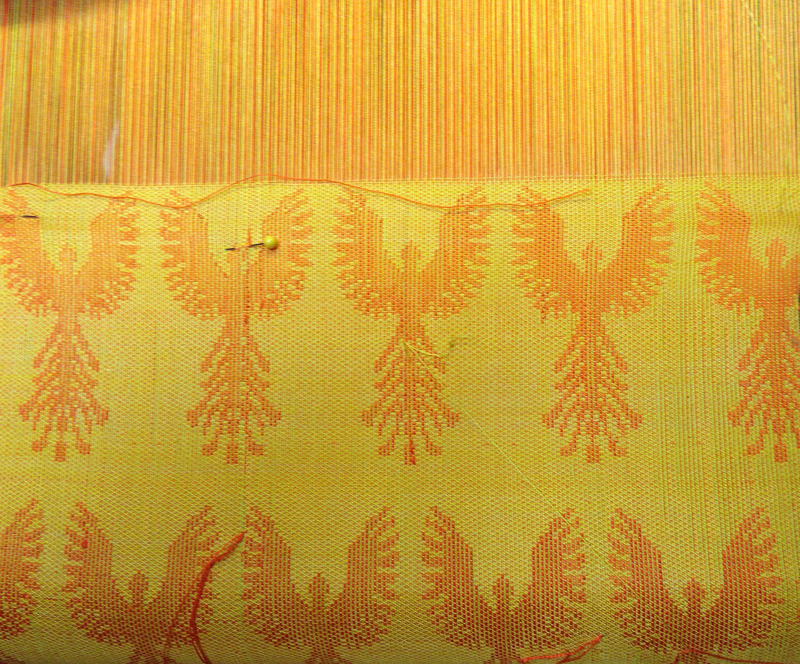 But the plan is to scrunch-dye it in shades of gold and pale orange, to give the effect of birds in an inferno. It might work and it might not. The only way to find out is to try! Anyway, I managed to pound out twenty inches of scarf today while taking a break from writing, so I’m about 1/3 done. (Finished length: 60 inches.) I’m hoping to finish it by next weekend, and if it turns out well, I’ll probably add it to my Designing Fabrics study group article. If not, I’ll cut it up for sample exchanges. I think it might have turned out better if I had used a deeper red for the pattern warp. As it stands, the birds are a medium orange, meaning it will be difficult to get background “flames” and still have the phoenixes distinctly visible. I might even consider keeping the background solid, except that I think it looks awfully plain as it stands. Tomorrow I go to the San Francisco Chocolate Salon in the morning, and to visit a mad scientist/inventor friend in the afternoon. Both promise to be interesting – the Chocolate Salon is the biggest chocolates show in the Bay Area (possibly on the West Coast) and features 55,000 square feet of vendors, according to the materials. In any event, tons of artisan chocolatiers will be there, with free samples. I plan to be at least somewhat restrained – I’m not there to pig out on chocolates, but to find exotic and interesting flavors for this year’s chocolates. If I’m pigging out on chocolate, I’ll lose my palate sensitivity early on, so I need to save my taste buds for the really novel stuff. Back to writing! I hope to finish the museum presentation today, and write the bulk of my Designing Fabrics study group article today as well.